Such is the intensity of Indian startup scene right now, that no one wants to be left behind. Western capitalists and huge corporations are now making a beeline inside India, as they strongly believe that India is the Next Destination. 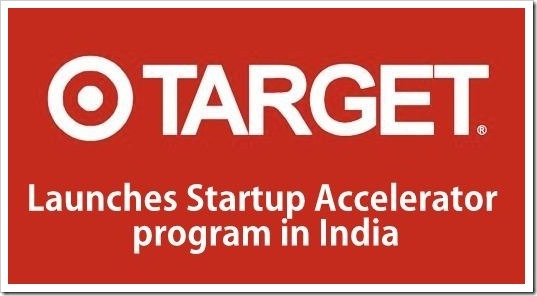 Techcrunch says that Target, the American retail giant worth $48 billion with 1800 stores all over US and Canada has decided to start India Accelerator Program, which will incubate 2 to 3 ideas every year. It is being speculated that this accelerator program will be headquartered in Bangalore and would start from January, 2014. Code named as Target Accelerator Program, it will be a fully corporate style incubator, which would be flushed with funds. The report says that accepted start-ups can get upto $30,000 as funding with “possible equity shares” as well. Beth Jacob, Target’s global CIO has confirmed this news via email. This program would be managed and run by Lalit Ahuja, who is a veteran when it comes to Technological startups and ideas. He runs his own accelerator program, Kyron, which is funded by $50 million venture capital from various sources. Which Sectors Would Be The Priority? Although not officially announced, but startup ideas from these sectors are currently hot right now, and Target would want to encash on this. Which Startups Have Been Invited Till Now? – DataWeave: It is a startup focused on Big Data analytics, and is funded by Times Internet and Blume Ventures. They basically crawl and scan big data across the web, and then store it. Working on a distributed platform, they make the big data simple to analyze and make use of. – Tookitaki: They are focused on social media. Using the web behavioral and the social media mentions of big brands, they churn out meaningful data which can be used by brands to produce relevant content and social media strategies. It has been recently funded by Blume Ventures, when they infused $200,000 into this startup. They are waiting till the rush of Black Friday and Cyber Monday are over, after which they will formally invite applications and startup ideas into their program. Who Else Is Starting Accelerator Program in India? Target may face stiff competition from various other corporate biggies, who are trying to establish their accelerator and incubators inside India. Coca-Cola: Yes, the world’s biggest softdrink company is going to launch their accelerator program in India, as per this New York Times article. Walmart: They have already bought Kosmix, a startup founded by two Indians which is into social media and content segregation sector. And their next plan is to open an incubator in India. Amazon is also believed to be very keen in starting accelerator programs for nurturing startups based in India. This is certainly an interesting phase in Indian startup ecosystem. Infusion of western capital and innovative ideas will no doubt fuel this revolution. What do you think about Target and other Western corporates entering Indian startup industry? Will it benefit us or overcrowd the industry? Do share your views! New Companies Act 2013: Should Indian Corporates Disclose Their Political Donations?